Please review event list for suggestions on other events, contributions are welcome! The Centre for Maritime Research (MARE) at the University of Amsterdam announces its fifth biennial conference, People and the Sea V: living with uncertainty and adapting to change’. The conference will take place from July 9?11, 2009, in Amsterdam, the Netherlands. Case studies page is updated with Abstracts. Interviews are underway. Wishing all readers a very Merry Christmas and a Happy New Year! The GAP project is co-funded by national governments and the EU under the Framework 7 research programme (Science in Society, Co-operative Research Processes). Project number 217639. GAP1 is phase 1 of a three-phase programme that aims to explore the complementary nature of alternative knowledge, investigate how to combine it in ways that will enhance understanding and management of natural resources. It paves the way for stakeholders to become actively involved in the delivery of scientific information. Together, the stakeholder and scientist participants in GAP1 will initiate cooperative research by making plans to combine knowledge in future participatory research. They will engage through a series of European and regional workshops. Tied to knowledge, GAP1 is an evidence-based approach that uses participation as the vehicle to improving understanding on fisheries research and management issues of common concern to stakeholders, scientists and policy makers. This is a pre-requisite for fostering the mutual respect essential for successful future collaboration. Mackinson, S., Neville, S., Raicevich, S., and Worsøe Clausen, L. (eds) 2008. 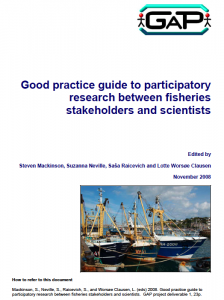 Good practice guide to participatory research between fisheries stakeholders and scientists. GAP project deliverable 1, 23p. (pdf). Estam guía aparecerá en breve publicada en papel y se editará también una versión resumida. 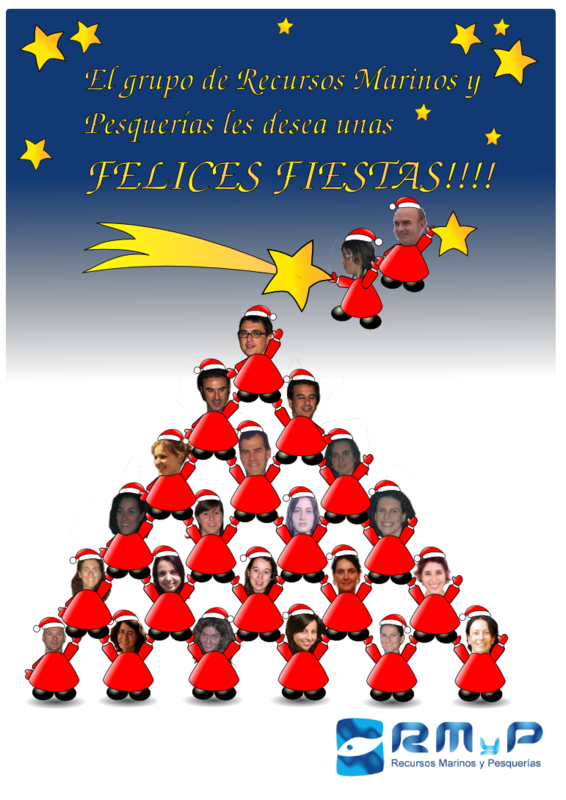 A lo largo de 2009 se irán publicado otros resultados del proyecto y, entre otros, un portfolio de casos de estudio que estamos compilando dentro del workpackage que coordinamos. Patterns of habitat use by spider crab juveniles, Maja brachydactyla, from two geographic areas on the NW coast of the Iberian Peninsula were studied through the analysis of carbon and nitrogen stable isotope relations in muscle and hepatopancreas. Main potential preys of spider crab juveniles in rocky and sandy habitats and different organic matter sources in coastal food webs were also analysed. Isotopic ratios showed no difference between rocky and sandy habitats. The use of carapace colour and epibiosis as an indicator of habitat use was not supported by our data. These results suggest that movements between the two habitats are much more frequent than suggested in previous studies. In the coastal food web, two main trophic compartments were identified according to their organic matter source: one based on plankton and seaweeds (rocky habitats), and one based on sedimentary particulate organic matter (sandy bottoms). By means of the model of Phillips and Gregg (2003), it was found that juveniles of Maja brachydactyla from both habitats consumed approximately two thirds of the preys in rocky habitats and one third in sedimentary habitats. 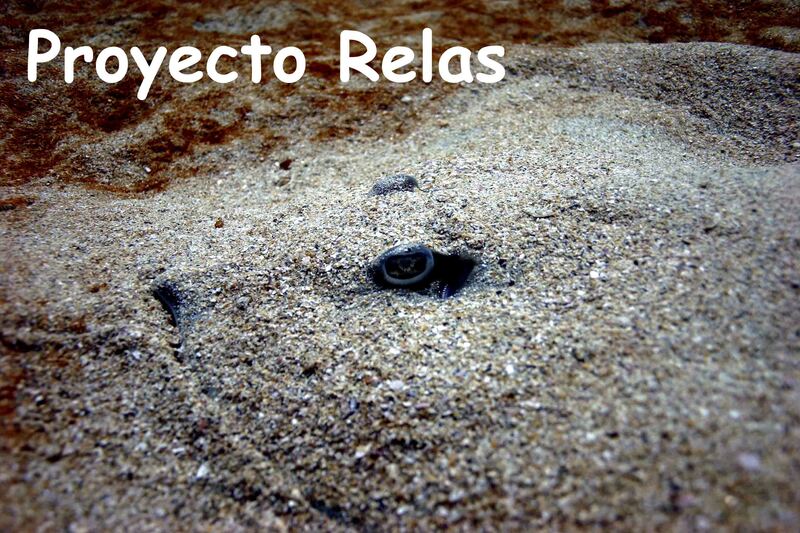 The results indicate that in exposed environments large juveniles spend most of the time on sedimentary bottoms, where they find more refuge, moving frequently to nearby rocky substrates to feed. Investigando en la Reserva. El vídeo. Recientemente hemos estado trabajando en la Reserva Marina de Interés Pesquero de “Os Miñarzos”, de Carnota (A Coruña). En este vídeo puede visualizarse parte de nuestro trabajo. El vídeo está dedicado a la memoria de Tomé, recientemente fallecido.